Kid Friendly Vacations are expected at Disney World. Even families with teens can have fun because Disney has something to offer everyone in the family. Disney vacations are made for dreaming and for making magical memories but if someone in your group or family isn't happy then the entire trip can be ruined. If you are dreaming of taking kid friendly vacations to Disney that will appeal to everyone in your family, even your teenager, then you have come to the right place! We provide all the information you will ever need to know in order to make your next family vacation to Disney magical. Have you ever wanted to be a treasure seeking pirate or maybe even a beautiful fairy tale princess? At Disney World, all of these dreams can be turned into reality. A pirate can find more than enough action packed fun and adventure to keep him from wanting to walk the plank. And the Magic Kingdom is certainly the enchanted kingdom of choice for any princess. This is our family in the picture above, everyone except me because well I'm taking the picture. You can meet me by visiting here. Maybe this is why our family loves everything about the Walt Disney World Resort. My husband began visiting the theme parks when they opened and, as a family, we have visited that very special mouse several times a year since 1993. Our three teenagers, ages 17, 15 and 14 never seem to get tired of what the resort has to offer. So we thought we would share all of the things we love about this magical destination with you. We will share our thoughts and recommendations for resorts, restaurants, theme parks and so much more. And, we invite you to share your family vacation magical memories with us too. Even our children will give their opinions and advice in "kid commentary" throughout the site. Kid Commentary will be identified with different character icons. When you see them please take a minute to read what the children have to say! They have their favorite rides, restaurants, hotels and characters and I would be willing to bet that your child or children, even your teenagers, have their favorites too? What are their favorite rides at the Magic Kingdom or who is their favorite disney characters? What is it about Disney that makes it your favorite destination for kid friendly vacations? We invite you to share your personal stories and memories from your Disney vacations with us by creating your own web page about your kid friendly vacations at Disney World. All you have to do is find an area that is of interest to you on our magical memories page, click on that link and then fill out the form found on the page that you selected. Once you have filled out the form and submitted it to us we will review your story and notify you when your page has been created. It’s that easy!! If you would like to see an example of some pages that were submitted by other people, check out a Mouse Tail and Tried and True Magic Kingdom Favorites. This magical world is definitely the place where all of your family vacation dreams can come true. There are so many things to do and different things to experience that everyone in the family, young or old, will be happy. Our family invites you to check out our site and all of the information, experiences and memories that we have to offer. 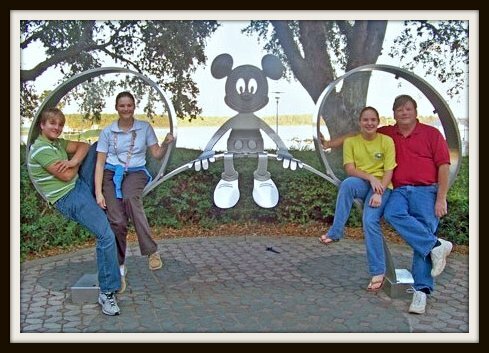 Maybe our love for the mouse will encourage and inspire your family to take many kid friendly vacations to Disney World too. If you can not find what you are looking for, you can search within our site by using the search box below. WDW News - Find out what is going onin the World of Disney. The Disney Blog keeps you up-to-date with all additions and changes to the princess-and-pirate-family-vacations.com Web site. Subscribe here. Do you have any Disney Magical Moments to share with the world. Tell us about your favorite rides, attractions and resorts. Disney Characters - Do You Have A Favorite? Which one of the Disney characters is your favorite? If you could choose to be any character which one would you choose? Which character best fits your personality? Disney for Dads info can help Dad enjoy Disney World by learning to "Sail With The Tide"
Find out which of the Disney Resorts is the right one for your family's needs. From Value Resorts to Disney Villas, there is a resort to fit any budget. Suggestions for finding a Disney Value Resort that will meet the needs of your family but not break the bank. Value resorts are perfect for families and a budget. Disney Moderate Resorts offers a wide range of choices in style and atmosphere. Each resort is a unique vacation destination in itself. The Disney Deluxe Resorts offer comfort and convenience that makes staying on Disney property a magical experience. Disney Vacation Club Resorts are designed to provide guests with all the comforts of home while vacationing at the Walt Disney World Resort. Disney World Parks - Do You Have a favorite? Find out what the four major Disney World Parks have to offer. The parks include the Magic Kingdom, Disney's Hollywood Studios, Epcot, and Disney's Animal Kingdom. The Magic Kingdom theme park at Disney World is a place where all your fairytale wishes can come true. Disney's Epcot center is a different kind of Disney Theme Park. Find out what the future holds with research and technology presented through exciting rides. Epcot World Showcase immerses you in the culture of eleven different countries. You'll forget that you are still in Florida as you visit these charming countries. Disney's Hollywood Studios captures the glitz and glamour of Hollywood. Disney's Animal Kingdom is a different kind of Disney theme park. It offers an up close and personal experience with animals in their natural environment. How do you know what Disney park tickets to purchase? Disney's Magic Your Way Tickets offer several options for you and your family. The Westside section of Downtown Disney has plenty of shops and restaurants but the main draw is its attractions and entertainment. Disney's Westside is home to DisneyQuest and Cirque Du Soleil. Downtown Disney Pleasure Island is currently undergoing a major transformation from an adult oriented party place to more of a family friendly environment. The Disney Dining experience can be wonderful or it can ruin your vacation. Learn from the experience of others and make the best choice in restaurants for your family vacation. Disney restaurants include many quick counter service eateries that serve good food fast to those who do not want to take a break from the action packed fun. What Disney Food Is Your Favorite? We all have our favorite foods. What about your favorite Disney Food? Some people swear by certain restaurants, others a particular snack. What about you? Disney Character Meals - Which One is the Best for Your Family? These Disney Related Links offer our guests the opportunity to visit other Disney web sites from around the world. Florida Travel links provide quality insight and information about some of the most popular vacation spots in Florida. Link to Us provides a submit form for review link exchange possibilities. This webmaster information will tell you how I turned my love of all things Disney into a Website. Do you have any questions Comments or Suggestions? Would you like to share your knowledge about kid friendly vacations? Great, find out how you can submit your story or tip here. © copyright 2008-2010 Dana Online, LLC. Princess-and-Pirate-Family-Vacations is not affiliated with, maintained by, or in any way connected with the Walt Disney Company. Disney, Walt Disney World and it's theme parks, resorts and attractions are trademarks or registered trademarks of the Walt Disney Company and/or its affiliated companies.